How does Sara like her tea? Nice 'n' frosty. Try her recipe for green tea ice cream and you'll understand! Ready for Saras latest class? 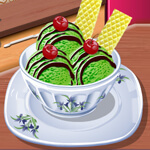 Today, she will be making some tasty green tea ice cream in this fun cooking game. 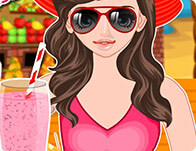 Let her walk you through each step in the recipe as you get everything ready to go. Score bonus points if you follow her directions carefully and whip it all up fast. Green tea ice cream is fab with fresh fruit, but if you're in the mood to splurge, chocolatey fudge sauce with cherries on top is good, too!